In May 2018, the Dzawada̱ʼenux̱w First Nation of Kingcome Inlet, BC launched a BC Supreme Court case to extend Aboriginal Title to the ocean with the intent of dismantling salmon farming in the Broughton Archipelago. 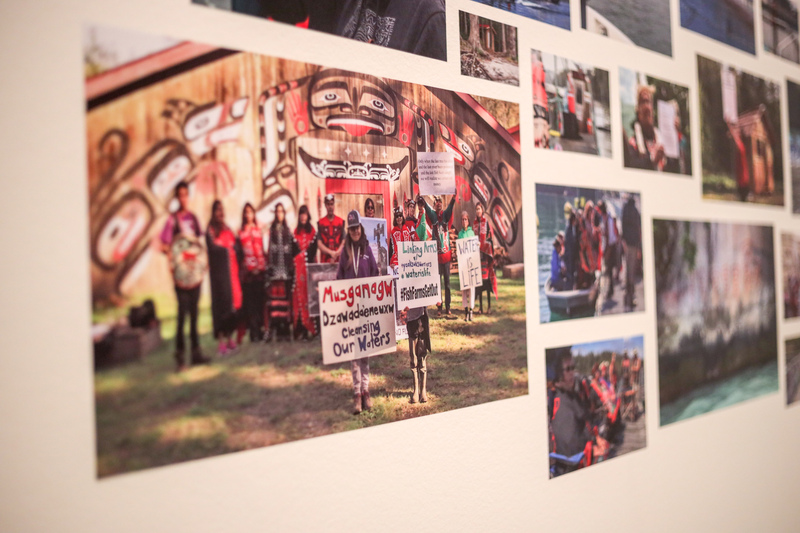 That same summer, a group of over a dozen artists gathered to address these threats to unceded territory and water. 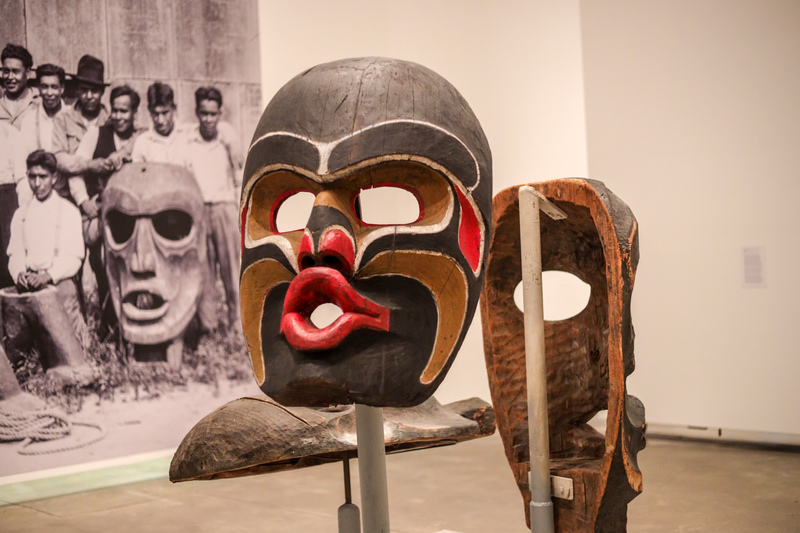 Hexsa’a̱m: To Be Here Always at the UBC Morris and Helen Belkin Art Gallery is the result of this — a collection of works from artists of many nations and of diverse mediums. The exhibit centres on the resistance and pride of an entire nation in the face of pressure from the Canadian Government and private corporate interests. It’s an experience that not only seeks to transport the viewer to the Kingcome Inlet but also to promote a familiarity with the context of the issue through the timeless songs, dance and art of Dzawada̱ʼenux̱w. The best primer for contextualizing the exhibit came in the form of storytelling, seen written in Video interview transcript with Melissa Willie, Midori Nicholson and Willie Moon from Summer 2018. Here, three members of band governance explain their perspective on battles with salmon farming and logging companies on their unceded territory. A similar piece, A’axsila (to take care of) by Lindsey Willie (Dzawada̱’enux̱w), portrays the same theme through photojournalism. Both explain the situation in Kingcome Inlet and inject a sense of anger and desire to learn more about the issue. In the same room, Feast Dish Lid is a poignant symbol of the potlatch — a tradition subjected to a lengthy ban in Canada from 1885 to 1951. Other pieces show innovative uses of mediums by artists such as Akia by Siku Allooloo (Inuit/Haitain Taino), which features a display of sealskin on canvas arranged in the form of poetic script. 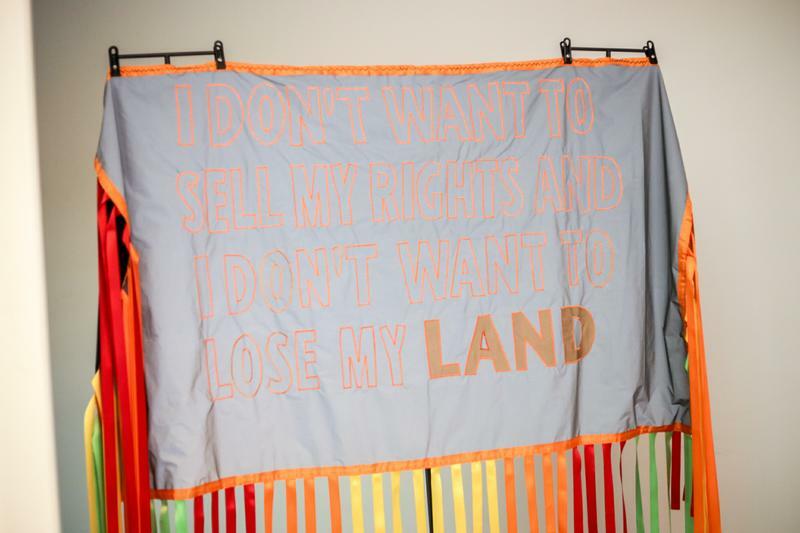 These works show that the exhibit isn’t limited by nation or medium and that their message is emboldened by the wide range of perspectives offered. The real emotional power of this exhibit comes after context has been achieved. Several pieces highlight the essence of Hexsa’am, where the viewer is granted a window into what this entire exhibit is about: the land. Great, sweeping shots of the landscape of the Kingcome Inlet are showcased in Hexsa’a̱m (To be there always) by Marianne Nicolson (Dzawada̱’enux̱w) and Althea Thauberger (Canadian) as well as with Gwa’yi by Nabidu Taylor (Musgamakw, Dzawada̱'enux̱w). These photos show the joy of a child singing, dancing and swimming in and alongside the inlet’s waters. The importance of the preservation of these lands and waters, of song, of dance and of language is made clear here. The songs and sounds from these pieces reverberate throughout the Belkin in a way that continues to echo in the head of the viewer. A lasting impression of Hexsa’a̱m persists, as does a desire to stay invested and involved in their efforts.